From left are the bank’s Gouverneur assistant manager Dody Hilts, Gouverneur Breast Cancer Fund member Tammy Blevins, Fund president Carolyn Pistolesi, Fund Treasurer Judy Bush, Fund member Terry Pistolesi and bank Gouverneur branch manager Diane Easton. 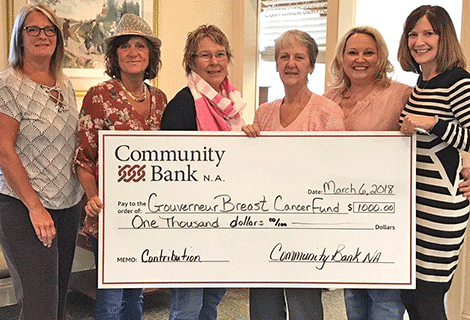 GOUVERNEUR -- The Gouverneur Breast Cancer Fund recently received a $1,000 donation to support its 17th Breast Cancer Walk, taking place May 15 at Gouverneur Village Park. The cash came from Community Bank. All funds raised at the Breast Cancer Walk will directly benefit breast cancer patients in St. Lawrence, Jefferson, Lewis and Franklin counties throughout their journey from diagnosis to recovery. Founded in 2001, Gouverneur Breast Cancer Fund has helped more than 675 people in the quad-county area with their financial needs while battling breast cancer. In addition, more than 1,700 recovery gift bags have been distributed to newly diagnosed breast cancer patients.